Many are familiar with the effort in recent years to produce a major motion picture expressing the values of The Venus Project and its vision of a Global Resource Based Economy. But the origin of this idea extends to a much earlier time. Since the 1950s, Jacque Fresco sought to produce a motion picture depicting an optimistic future. He wrote what is now a lost script and called it Bright Tomorrow, “a documentary history of the future”. In 1976, Fresco wrote a new script for a film of science fiction edutainment entitled Welcome to the Future, in which astronauts were brought back to Earth in the future and revived from suspended animation to tour the new world. In later years, Fresco even wanted to use The Venus Project center as a filming location. By 1997, Fresco and a collaborator wrote a new story called And the World Will Be One, featuring a near-future scenario consisting of a city tour interspersed with sequences of autobiography. For a time, this was to serve as the basis for a new film until collaboration with a Star Trek animator led to consideration of a series for which 19 scenarios were conceived. By 2009, Fresco was proposing a new scenario featuring a grandmother, who, with her grandchildren, looked back at the past. Finally, in 2011, a successful crowdfunding campaign raised $200,000 to begin development of a script. Screenwriters were in contact and immediately began development. Four of the options centered around Fresco’s grandmother scenario and seven featured biographical scenarios or featured Fresco as a character. One option consisted of a treatment for a three-season series. Two options were entirely unique far-future scenarios. After fourteen options and several other undeveloped scenarios, Roxanne Meadows and two experienced producers worked toward reshaping a new script received from two screenwriters of the Writers Guild of America. It was the most cinematic screenplay up to that point. Despite compromises to rewrite the script, neither Fresco nor Meadows were satisfied. By this time, Fresco was experiencing symptoms of Parkinson’s disease and this would require more and more of Meadows’ time. Interestingly, it was found that five common but major problems troubled the scripts. Over-reliance on exposition flattened the plot. Many of the scripts were exposition-heavy, focusing on extensive narration, dialogue, or monologue during tour scenarios, rather than action and events necessary to make a film dramatic, climactic, or cinematic. Many featured an excess of hostile conflicts rooted in the value system typical of our current culture (what Fresco referred to as “schlock”), rather than reflecting the values and vision of The Venus Project. Over-reliance on Fresco’s biography, often introduced superficial or contrived flashbacks that disjointed the main narrative. In correcting problem #1, important information would be lost. Failing to effectively translate information into action-event sequences, for example by adding in too much arbitrary action in place of message, reduced the signal and increased the noise. The more the story felt like a movie, the less it looked like The Venus Project. The more it looked like The Venus Project, the less it felt like a movie. In correcting problem #2 without sufficient inventiveness, the plot would be lost. This issue stems from a more general problem that has always troubled writers of utopian stories: to show a culture or human conduct without the conflict and sicknesses of today is almost antithetical to (or at least severely constrains) the mechanics of storytelling as we know it. This, in part, explains the prevalence of dystopian science fiction serving as far more convenient for storytelling about the future. These problems generally stemmed from a deeper problem: having knowledge-deficits in core areas. These included 1.) Fresco’s body of work and the ideas that influenced his work, 2.) command of storytelling and reference-base for creativity, 3.) experience in the entertainment industry, and 4.) trends of contemporary culture and technology. One person having all these to a sufficient degree represented a primary challenge. All scripts suffered from an overall lack of strategy. Script writers often face the pernicious problem of not always knowing what they did that didn’t work well. Feedback from readers is replete with opinions of unqualified observers. Inconsistent feedback leads one to vague or ambiguous conclusions. This poorly supports learning or error correction. Nathanael Dinwiddie, at the time an archiver for The Venus Project and one of the editors for The Venus Project’s documentary, The Choice Is Ours, gave extensive feedback about the latest script prior to its final rejection. Soon after, he was asked to begin development for a new script, rethinking from the ground up while continuing work in other areas. Nate had by then graduated with degrees in film and media studies and philosophy, and lesser studies in archiving and behavior analysis. Through his archiving, he developed an extensive familiarity with the subject matter of The Venus Project. In planning for scope, he understood the magnitude of the task and witnessed the difficulty encountered in past attempts to develop a script. To fulfill The Venus Project’s vision for creating social impact through storytelling, Nate requested to research key areas to gain better insight into forming a strategy. Five phases have proceeded concurrently and iteratively toward progressive elaboration. And a review of past scripts, Fresco’s lectures and writings, and related documents. This agenda grew to encompass other, more foundational areas including project management, creativity, learning, lean methodology, and transmedia storytelling. Research Nathanael’s research process employed both algorithmic and heuristic techniques for 1.) accounting and surveying above sources through databases, encyclopedias, and syllabi of curricula, 2.) a discriminatory selection and examination of sources using techniques of time compression, and 3.) extraction of information into notes. Parts of the research agenda are still underway. Nonetheless, other phases have proceeded concurrently. Programming The concept of “programming” is borrowed from the practice of “architectural programming.” Some have drawn parallels between the process of drawing a blueprint and the process of writing a script, especially when it needs to serve an end function or mission (purpose-driven design). In both cases, data must be gathered, problems must be identified, functions must be determined, goals must be stated, and these considerations should determine decisions that define an appropriate design solution. The creation of a story turns on the axis of decision making. Although these are “creative decisions” that in artful contexts are often more arbitrary, efforts have been made, in our case, to “arrive at decisions,” even within storytelling. This makes the process something akin to engineering. This is no surprise considering that, by extension, the film itself and its story are intended to function as an instrument of social engineering. Unfortunately, this has not yet been formalized and standardized to streamline development like other forms of engineering, until now with transmedia storytelling (described later). In programming, a number of goals, constraints, and challenges were identified. The aforementioned problems of excessive exposition and translating the information into sequences of compelling events. That is, discretely walking the fine line between education and entertainment. The aforementioned problems of perpetuating a socially detrimental value system in action and dialogue. That is, telling a story about a society where the usual interhuman conflicts and destructive behavior (that drives and carries most plots) are eliminated, while still telling a story that is engaging, dramatic, and emotionally moving to the audience. Remaining true to The Venus Project’s vision while updating specific areas to appeal to contemporary sensibilities. There is a diverging impulse to use both what Fresco envisioned but also to integrate other ideas. The challenge is in giving utilitarian consideration to both and objectively balancing the outcome. Maintaining a competent futurology, extrapolating a plausible set of circumstances in the future from initial assumptions and current trends and trajectories. Simplifying ideas for the audience, yet not to the point of distortion. Showing an alternative social system to the audience that they accept/want/prefer, meanwhile not unnecessarily plugging today’s values into the future merely to help the audience relate to it, while still making the story and characters relatable. Showing a future world of a sufficiently broad scale to improve chances of a film series or television series, or more, developing from it. Rendering the presentation in a way that does not undermine the seriousness of The Venus Project’s mission, such as making it look as fictional as the movie. Making an unprecedented work of futurology and social theory expressed as science fiction. The classic problem of imagining how the “transition” unfolds. Generating revenue for The Venus Project. This requires extensive networking and marketing, and trends toward conformity to pop culture expectations. Lay foundation for series or a transmedia IP. This requires long-range coherent planning. Posterity. Endure in the cultural memory. This requires highly relevant and original ideas (relative to the current time) that appeal to film critics who represent the curators of cultural artifacts that go into historical record. It also helps to have wide distribution (through the film industry or social media). Reminds me of the old catch phrase. Its bigger than Ben Hur! Fantastic news! Thank you for keeping us up to date on the status of the movie – and the dedicated people who continue to work on this important effort. Special thanks to Nate – for getting this information – to us!!! So very, very exciting!!! I was going to say the very same thing! This is excellent! I appreciate they told us! “Euripides Snead,” hilarious codename. Does anyone know if the system of naming conventions Jacque proposed in the TROM documentary is an actual system? Brilliant work Mr Dinwiddie. Thank you for illustrating a systems thinking methodology. Extremely well organized – great minds at work. Have you read “Beyond Biocentrism” by Robert Lanza …. he certainly explains how Quantum Theory experiments have thrown science some great curve balls. Essentially, we are back to “all is one” when trying to figure out science and how biology and consciousness must be studied more seriously. I can see where Lanza could open our minds to more ideas, including the Venus Project. So glad to hear the message will continue to be spread by creative and innovative means. Entertaining is definitely an excellent way to educate while sharing the excitement and intention with access to a large audience. Well done with the attempts to refine a script to reach as many people as possible, I hope the quest for perfection takes second place for the need to get the message out and raise more support as soon as possible. 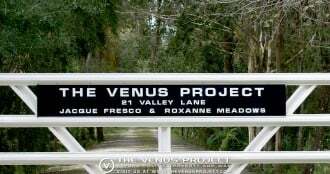 Love to the Venus Project, keep up the great work! It seems the conflict is to both present a true representation of what the venus project;s message is – and have that truth and reality formulated in a way that is in-line with conventional movie structures and dynamics. There is a way to present it that meets both criteria without compromise. Pull time timeline of the script closer to present day – illustrate the story of transitioning from our current world model and into what the venus project proposes. Orientate the script around the ideological conflicts and stages where they play out. Bring the focus of the film around the settings and stages of where this ideological transition takes place – the point at which both the old and new world is present – the movement started in the light of documentary about truth in our current times, the film would suit well to present an example of that ‘next step’ that we are currently facing. Show both the battle and the victory – then finish of the ‘future fruits’ of it. The content is right in front of us, we are living it now – perhaps paint this question… what does a transition look like? A few disasters, think of 1960’s Thunderbirds for example. A View from the Gallery, Season 5, Episode 4 of Babylon 5 TV series. > of the maintenance crew. You could sprinkle just enough TVP details / facts into the story to educate, but not too many to make it stodgy and dull. thank you for all these precious details filled with clarity defining what can not be yet imagined in its full perspective,i wish that more young creators come into play and get opportunity to express how they see this with their hearts open and their imagination taking us to 5th dimensional new earth realities that i am sure our minds can not conceive,artists passionate and dedicated in just doing this is what we need and it is here already through the milllenials and star children,so to be continued in excitement so Jacques can be really proud and even more happy of how his work continues,much love and light,we are with you always in heart and spirit for the highest good for all,hallelujah! I think a single stand alone movie with a duration of 3hours.I also think even with a major motion picture, a test city is the only way to accomplish the goal of the venus project.There is no way a movie or series of films will ever push people to actually want this unless it is built.The cold hard facts hurt sometimes,but a test city or multiple test cities must be built.Media just doesn’t do enough for humans to hardwire them to this concept.On that note i have always supported tvp financially and by word of mouth.I am very happy to hear this great news of continuation of films for our lives and the future of humanity. Inspiring … yet … I truly hope that the city is somehow designed and built before I am too old to make any meaningful contribution. Pienso que respecto al guión, sería mejor dentro un crack y desplome económico o transicion económica, que es lo que implícitamente estamos viviendo desde el crack del 2008, de acuerdo a economistas, que he leído en estos años, este crack traería crisis más continuas y rápidas, de ciclos económicos de caída, este sistema simplemente no da para más es como manejar una empresa en quiebra, ni si quiera los recursos son respetados. En vez que la perspectiva del guión sea a un futuro lejano, sería un poco más interesante de desarrollar la trama en este período de transición o debacle económica.